I’ve decided to try something different – paper armies! 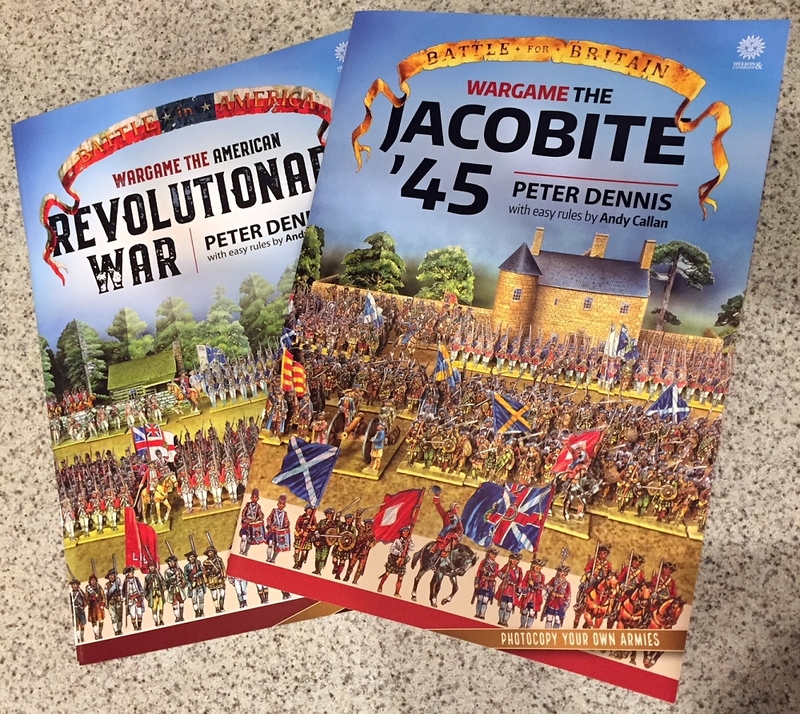 For the last couple of years I’ve been keeping my eye on the rapidly growing range of books that Peter Dennis has been pumping out, each one covering a different campaign using 2D paper soldiers and scenery. After having enjoyed so much making some Dutch houses out of cardboard, I finally decided to give these paper figures a go. So I ordered two books to try out, covering a couple of periods I’ve always fancied, but couldn’t face starting to collect and paint from scratch: the Jacobite ’45 Rebellion, and the American Revolution. Actually, this isn’t the first time I’ve played with paper soldiers. 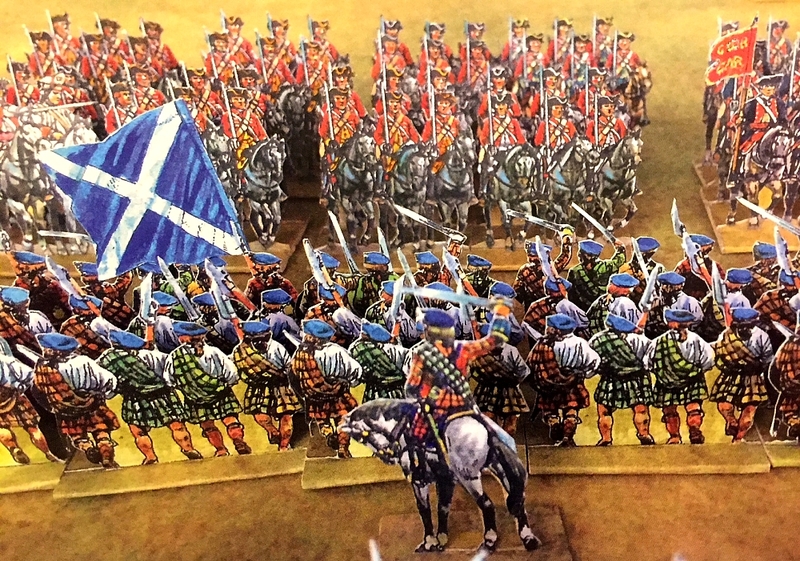 Many, many years ago (er, many decades ago), my then-flatmate Alan Hollows drew and cut out two Seven Years War paper armies, using a whimsical style reminiscent of Asterix the Gaul. I wonder if any New Zealand readers still have photos of these wonderful home-made figures? Anyway, back to the Peter Dennis books. On receiving my package in the post today, I was very pleasantly surprised to see the books were choc-a-bloc with not only every type of figure you would need for both sides, but also flags, artillery, carts, casualties, markers, appropriate buildings and trees, and even two sets of wargames rules (beginner and advanced versions). Wow! You can see the quality of the artwork from the illustrations I’ve reproduced here. The fronts and backs are carefully designed to line up. But please don’t try assembling the sample images from my blog – my camerawork will have put them out of alignment … and, anyway, you should buy the book! I’m told the finished figures are very sturdy, despite being made out of paper. You can literally throw them into a box after a game, give it a good shake, and they’ll still come out good as new next time you play! Apparently the 2D effect works well in wargames, as the players generally stand on each side of the table anyway. I’ll be intrigued to see how this works in real-life – but the photos in the book are very promising. Anyway, I’m going to enjoy trying to build my first army over the next few days. But even if I were never to cut the figures out, these books are simply beautiful to look at in themselves! 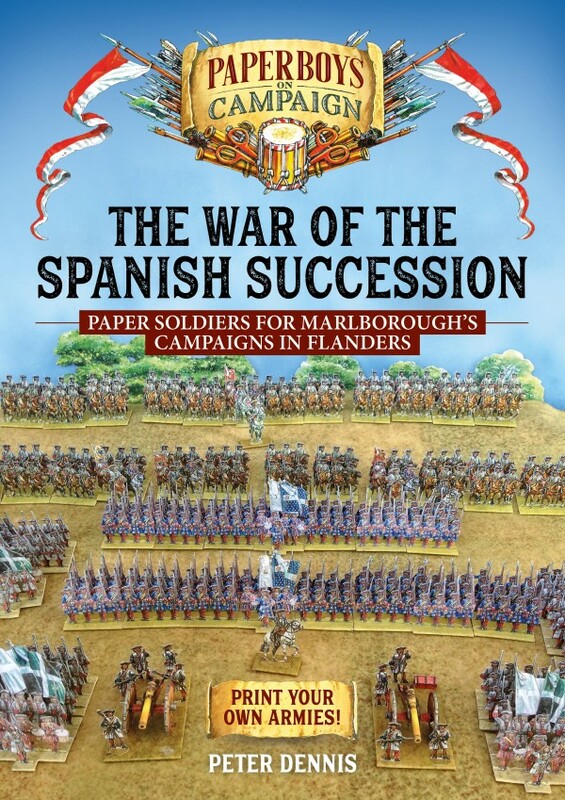 I’m also really excited that later this year Peter will be publishing a book for the War of the Spanish Succession – another colourful period I’ve always fancied, but couldn’t face starting. 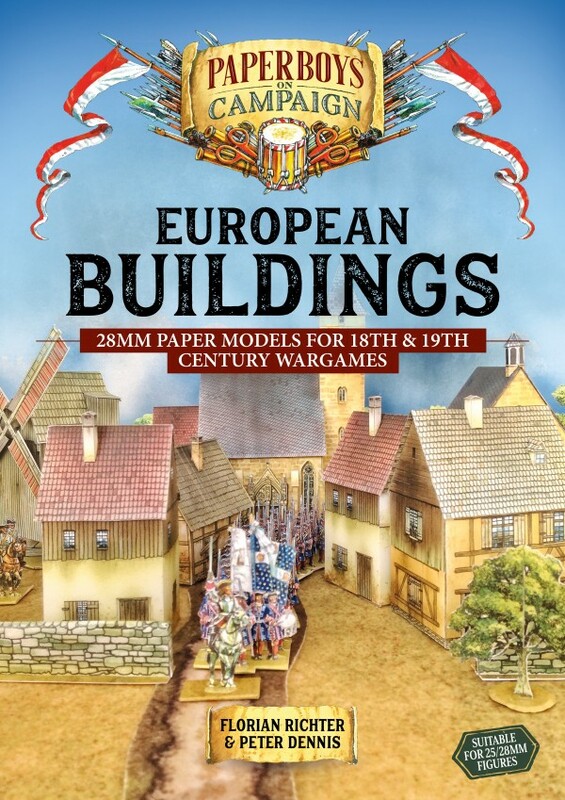 He’s also coming out with a book of (3D) buildings for eighteenth-century Europe. I’ve pre-ordered both books already! 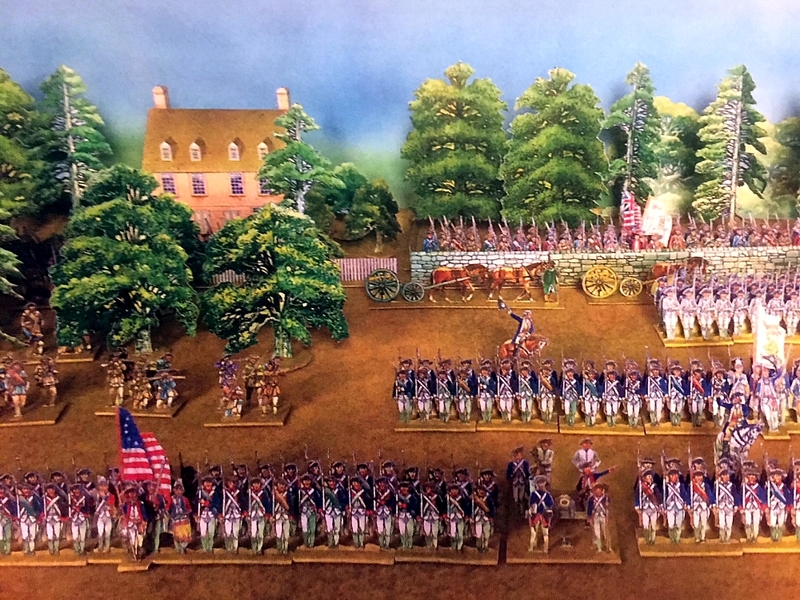 Next Next post: Four hours to make a 112-figure regiment in 28mm! These look very cool indeed! I could say offering a whole different dimension to wargaming (but I shouldn’t, it’s such a bad pun – oh wait, I just did…) Bad wordplay aside they look very cool, and I imagine a lot of thought must have gone into how they could be set out in a printable and bound book that can then be cut out. Peter Dennis had a display table at Salute last month and his ‘paper’ armies looked very impressive. I saw some photos of it, Lee, which helped convince me to buy. I’ll see how I go with cutting, Chris. But, as I said, even if you don’t cut the figures out, the book is still beautiful in itself. Are you able to copy and print the figures onto a sturdier card stock? Paper armies seem like a good way to get started in a new period. I’m intrigued more by the buildings since I already have AWI and Jacobites in metal. Hi Jim. The book actually requires you to scan or photocopy the figures anyway – you can’t use the actual pages. So that means you can print them on anything you like. The author suggests 100 gram (28lb US) paper for the soldiers, 160 gram for the buildings, and 160-200 gram for the trees. To give you an idea of what that means, standard printer paper is usually 80 gram (20lb US). Thank you for sharing. I enjoyed the video enough to be tempted by a new period before I have finished my current project. No! Flats have been around for more than a century but they were metal. The paper toy soldiers have have a “cute” factor that appeals to me. Yes, I have a few metal flats I picked up in Germany in the early ’80s (about the same time Alan Hollows was making his cardboard SYW army!). 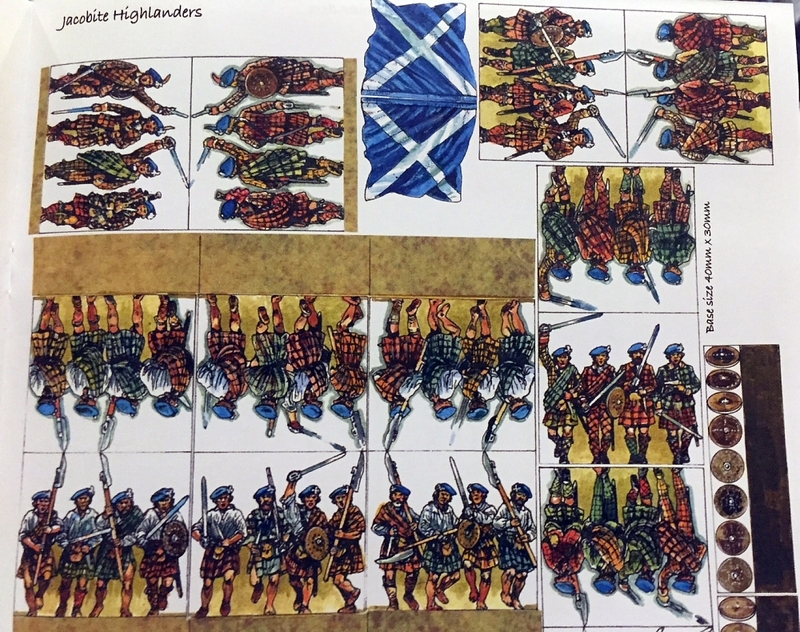 Paper soldiers are quite old too, and were a popular 19th century hobby. Best of luck with putting these together, Roly. Certainly less time consuming than painting up figures. 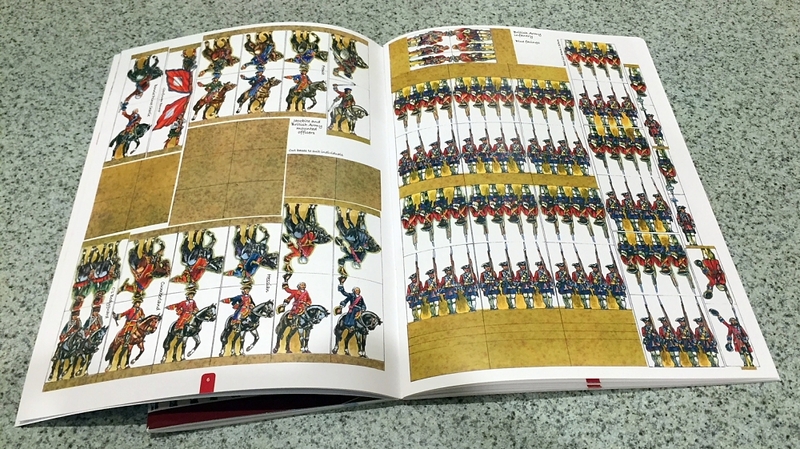 It’s taken me years to build up my AWI/ SYW/ ’45 armies…and I still haven’t finished! 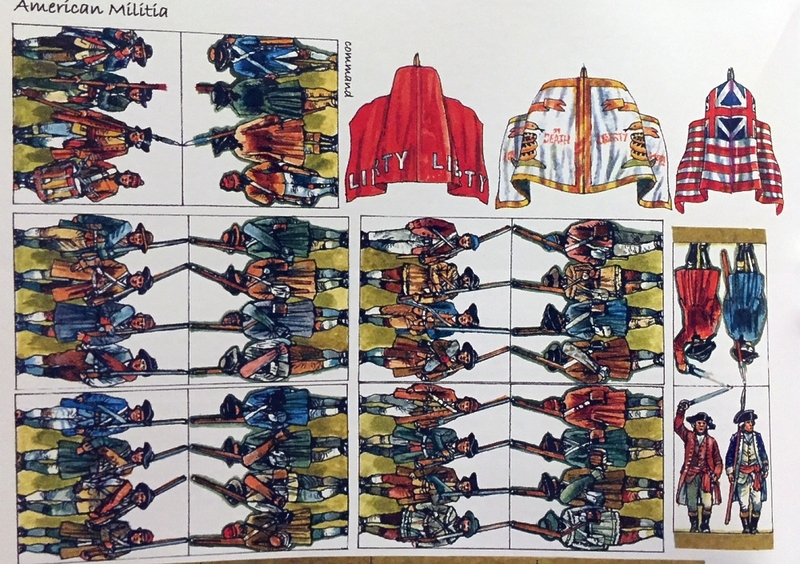 An effective way of quickly producing a great looking army. You’ve got me interested! I saw these at Milton Keynes wargames show Campaign yesterday (12/05/18) They really looked the part. I thought the trees, especially, looked good. But the whole was equally impressive. I might consider buying the WSS and buildings.